At the outbreak of the Second World War Leighton Bowen was a Territorial Trooper in the North Somerset Yeomanry. 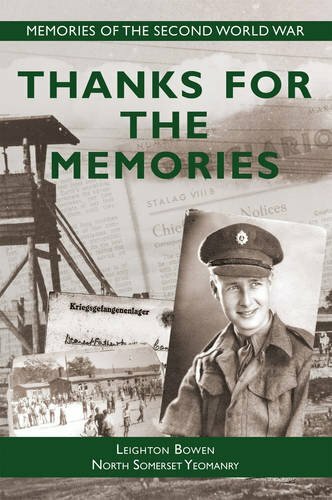 This memoir covers the time from his training and mobilisation and his experiences as a Prisoner of War for most of the war. Leighton and his battalion were sent to Crete in May 1941, and were thrown straight into action trying to hold up the advancing Germans. One week later the island had fallen; unable to secure a place out, Leighton and his comrades were taken prisoner. However they immediately escaped the following day. At large for a week, but with nowhere to go, they turned themselves in. The remainder of Leighton’s war was spent as a POW, and these experiences constitute the bulk of the book. Camp life, escape attempts, and the daily grind of just trying to survive are covered in fascinating detail. Bowen was not freed until April 19145 when the Americans advanced. The account doesn’t end there and some of the most interesting detail surrounds what happened once the camp had been liberated; the former POWs were pretty much left to their own devices and it was a couple of weeks before Bowen was able (almost reluctantly!) to secure passage back to Britain. Based on over 400 pieces of correspondence and documents, this allows for quite a full and comprehensive account to be written, also referencing the personal diary entries made during his time as captive.